The Innovation Laboratories for the Quality Assurance of Vocational education and training (iLab2) constitutes a two-year project (2012-2014) implemented under the Leonardo da Vinci: Transfer of Innovation Programme. Its main objective is the improvement of the vocational education and training quality through the Innovation Laboratory application in didactical processes. As a result of the project, the target group of beneficiaries: teachers, trainers and managers of VET institutions shall acquire new competences within the scope of application of the ICT technology in the educational process. An indirect beneficiary group, students of vocational education, shall develop its creativity, innovativeness, skill of problem solving, team work, efficient use of ICT tools through participation in classes during which the i-Lab shall be applied. An i-Lab (Innovation Laboratory) is an inspirational innovative facility designed to transport users from their everyday environment into an extraordinary space encouraging creative thinking and problem solving. It is based on a model created by Royal Mail’s Future and Innovation Group in Rugby, UK (1997). Its initial purpose was to provide simulated environments as a way of including new and potentially disturbing factors in organisational planning and to help management teams brainstorm future possibilities. 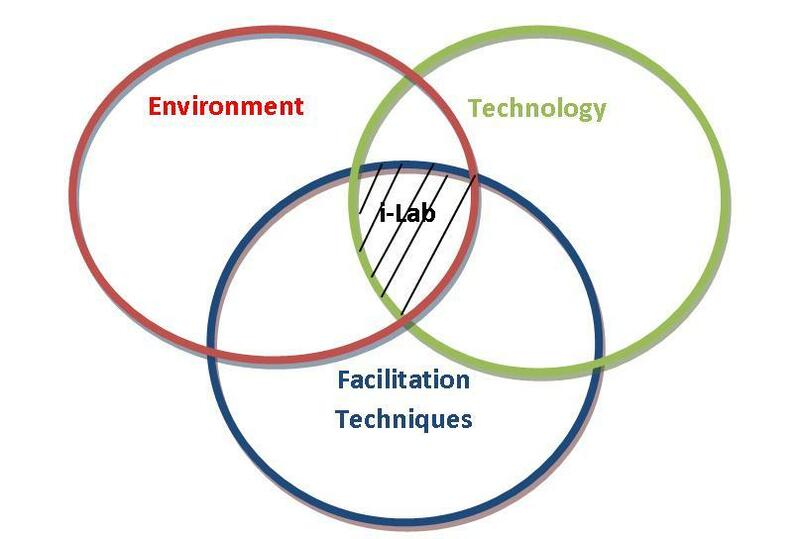 Therefore, the idea of an i-Lab has evolved to become a special place in which groups and teams can explore and extend their thinking beyond the normal boundaries of assumptions and constraints. “The result of the i-Lab session exceeded my wildest dreams! What would have taken a month of meetings was achieved in one very enjoyable day”. “The i-Lab is an inspiring and fun place to be. It’s almost a child-like experience where you forego any preconceptions about what you’re supposed to do and start from scratch”. The group work method applied in the innovation laboratories, aiming at improvement of group decisions, is based on the brainstorming method known for many years. Appropriately constructed software is an element constituting an advantage of the solutions applied in i-lab. After presentation of the issue, participants enter their ideas, further comments and proposal assessments on the screen. Ideas, any doubts concerning proposals and voting results are displayed on the projection screen in the room. Main advantages include anonymity, honesty and speed, as it excludes chats, limits digressions and allows everybody to speak simultaneously. A half-day session in the i-Lab has been proven to be more ideas driven and results led than a normal weekly departmental meeting. The features which characterize the i-Lab are privacy, multiple media for working and a distinctive design layout that creates a vibrant, inspiring and creative environment. Writable walls, toys and other tools used, impressed the participants with the atmosphere which brought them back to their childhood. i-Labs constitute flexible spaces and are applied by various types of organisations and institutions. Enterprises (from small companies to large international corporations), public organisations, training and educational institutions (including universities), as well as charities successfully use the potential and convenience offered by the i-Labs. The innovation laboratories constitute support for any team work, including among others planning (e.g. action scenarios), management (e.g. of changes, conflicts, projects), development (e.g. of strategies, products, services), mind mapping, organisation of consultation or focus groups, trainings and many others.